I’ve been living in the UK for over seven years now. Along the way I’ve become a British citizenship, I’ve acquired a wonderful dog, and I’ve accumulated a lot of “stuff”. But I still regard Chicago as my “home”. It’s where I grew up and almost all of my family still live there, as do many dear friends. And even after seven years, I still get a little “homesick” sometimes. Food is a natural way to go get my fix of virtual family time. I am very grateful to my mother who put together a family recipe book, a collection of recipes spanning three generations and nine households. I turn to this book often, with the most stained pages being Auntie Jo’s Sunshine Cake (now legendary across the globe), Aunt Sue’s Cranberry Chutney (a must-have at Christmas, amazing with Stilton), my sister’s Ranch Dressing (Clausen dill pickle juice is the key) and Grandma’s famous Oriental Coleslaw (especially popular with my friend, Henry). Back in the day, we used tomato soup from the Campbell’s can (jazzed up with fresh tomatoes, Worcestershire sauce and grated cheese), but now that I grow my own tomatoes (and am wary of the salt and preservatives in tinned food), I make my own roasted tomato soup that is silky smooth without added milk, cream or cheese. 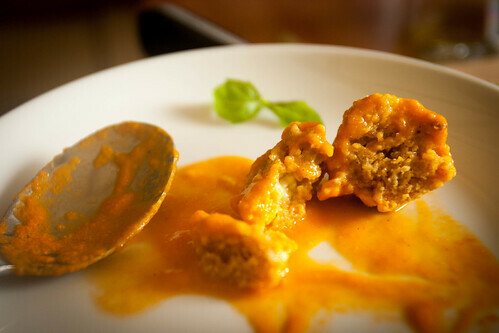 The cheese element comes from the dumplings, which couldn’t be easier: mix up grated cheese, eggs and breadcrumbs then spoon in bits of the batter. The dumplings cook right in the soup. In this case I was prompted to use Davidstow Mature Cheddar in my dumplings thanks to my latest blog post on Great British Chefs featuring this very soup. 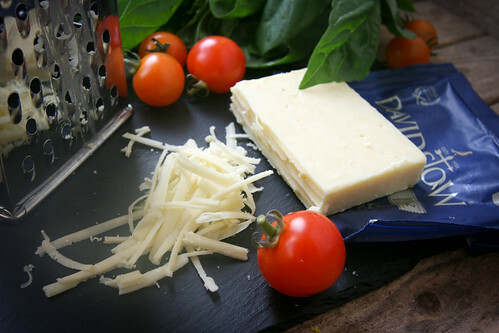 You could use whatever cheese you have on hand – it might be fun playing with feta, parmesan, gruyere or a combination of cheeses. You could also add fresh or dried herbs. Feel free to use whatever bread you wish for the breadcrumbs – I tend to go for wholemeal bread crumbs but white works just as well and sourdough is absolutely dreamy. The soup is vegan without the dumplings. I haven’t tried vegan dumplings yet but there are a few recipes around, including these chickpea flour dumplings from Edible Mosaic and these rosemary dumplings from Post Punk Kitchen. In the non-vegan version, the eggs help puff up the dumplings making them nice and light. Without the eggs, the dumplings would seem very stodgy to me, so if anyone has some good suggestions for a vegan alternative, I’d love to hear them! Preheat the oven to 190C / 375F and cut the tomatoes in half. 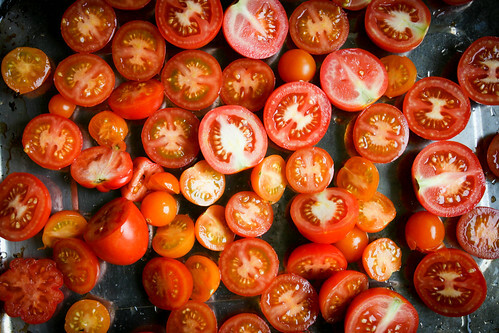 Arrange the tomatoes cut-side up in a baking dish. Drizzle with a bit of olive oil and season with salt and pepper. Bake for about an hour, until the tomatoes are totally soft and beginning to char around the edges. Heat a couple tablespoons of olive oil in a soup pot over a medium heat and add the onion, carrot and garlic. Cook for about 7 minutes until softened. Meanwhile, chop the basil stalks, and then add to the pan and cook for another minute. Add the roasted tomatoes (including any juices that seeped out) to the pan along with the vegetable stock. Stir and bring to the boil, then turn the heat down, cover and leave to simmer for about 10-20 minutes (until the carrots are very soft). Purée the soup in a blender (I used a Froothie Optimum 9400 Blender which works a dream for this purpose) then return to the pot and gently reheat. Meanwhile, make the dumplings by mixing together all of the ingredients – you should have a moist doughy mix that’s easy to shape into small balls (about the size of a teaspoon). Drop the balls into the hot soup and simmer covered for about 10 minutes. 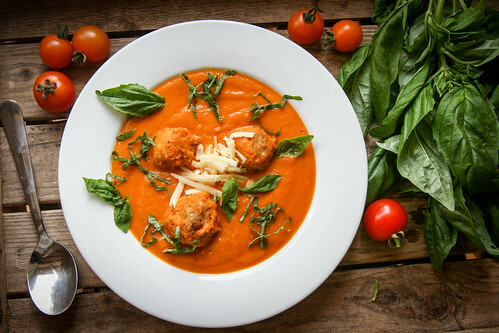 Ladle the soup and dumplings into bowls and garnish with grated cheddar cheese and fresh basil leaves before serving. * The impressive bunch of basil pictured in the top photo was grown by The Organic Farm Shop, who also supplied a few extra tomatoes to go in my soup. I also used their eggs for the dumplings and can only imagine that their award-winning homemade cheeses would have lifted this recipe even further. Their ingredients are top of class and the shop itself is a treasure, with a vegetarian cafe and Indian textile shop to boot. I highly recommend giving them a visit if you’re ever in the Cirencester area! 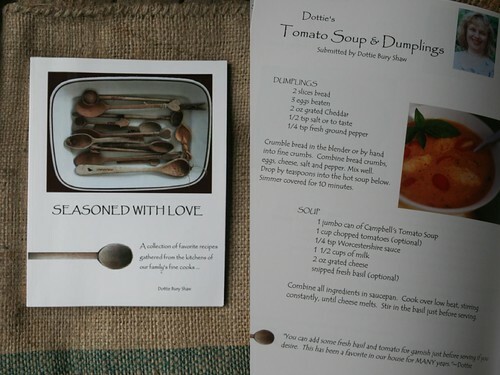 For us, mamtaskitchen.com is the equivalent of the book your mum made, but online only of course! That soup looks delicious and I love your photos, as usual! mamtaskitchen.com is like an evolving recipe book. I love it. Have you ever thought about putting some of it into print? Monica, I am totally thrilled that you’ve taken this great dish to new heights with the use of roasted tomatoes and those fine British ingredients. 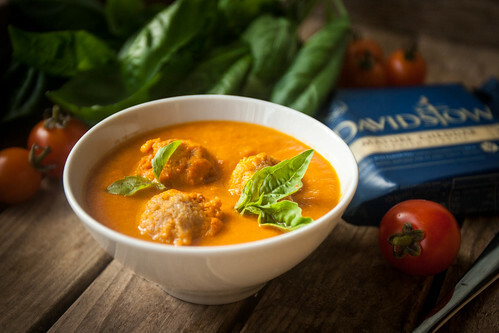 My neighbor is a huge fan of this soup, too…. when I make it I must send some over to her. It’s beautiful as much as it’s delicious. I love that you turn to that family recipe book again and again… as do many other family cooks. We do love our soups, a hearty meal in one pot is always wonderful! I made this soup recently with Ezekiel bread which was gluten free, sprouted grain. I was dubious, wondering if the dumplings would be light. But it was excellent! You’re right, we left Campbell’s soup for better options a long time ago, but the concept is a great one… thanks for keeping the tradition going! Side Note: A great array of wooden spoons on the cover of that cook book, I must say! Your soup sounds and looks so good! What a treasure that book of family recipes is, such a lovely thing to have! Too true, in regards to both family recipes, and comfort food. Dumpling all of the things! Your mum is a star, how special it must be to have such a lot of memories of dishes from a family cook book. I did used to love Campbell’s soup in the 80s but luckily we have all learned that home made is best! Yeah mom is pretty special – I have learned a lot from her! What a lovely keepsake Monica! And I love the soup. I made a tomato soup last night too, but no dumplings.